Description: An Interdisciplinary Approach to History. The As It Was! Series is an interdisciplinary approach to various periods in history. Students learn about the people, places, and issues of the world's past through the multicurricular activities in language arts, social studies, science, math, and the arts. Each book is divided into 3 major units, each with 9 sub-topics. The units are Issues, People, and Places. Each topic includes background information and 5 interdisciplinary activities. In addition, an introductory activity and an open-ended culminating activity are offered for each of the 3 units. 48 pages each. Grades 4-8. 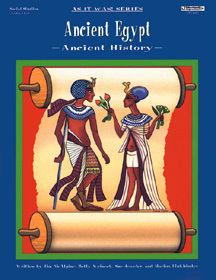 ANCIENT EGYPT: Issues include Hieroglyphics, Mum-mification, Book of the Dead. Religion, Art, Irrigation, Dynasties, and others. People include Amon-Re, Menes. Hatshepsut, Nefertiti, Ramses II, Imhotep, Cleopatra and others. Places include Nile Delta, Cities of the Dead, Memphis, Thebes, Nubia, Upper & Lower Egypt, and others. The As It Was! Ancient History set includes the following five books: Ancient Egypt; Ancient Rome; Ancient Africa; Ancient Greece;and Mayas, Incas, and Aztecs. You may also select the entire set.